Height may reach 65' with a diameter of up to 36"; narrow, rounded top, open crown; the upper trunk is often fringed with short drooping branches. Thick, deeply and irregularly divided by fissures into broad ridges; grayish brown; bark on twigs ragged and often peeling. Simple, alternate on stem, length 5" to 6"; often crowded toward ends of twigs; broad at middle (pear shaped) and wedge shaped at base; wavy and indented along margins; dark green and shiny above, grayish and fuzzy beneath; turns brown in autumn. 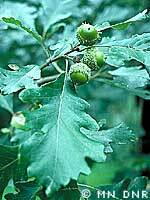 Nut or acorn, length about 1"; enclosed for about one-third of its length in a thick, narrow cup; usually in pairs on slender dark brown stalks that are 2" to 4" long. Common in river bottoms in the extreme southeastern corner of the state and in the southern part of the Minnesota River Valley; rarely grows as far north as St. Paul; requires moist soil as name implies; moderately shade tolerant, slow growing.